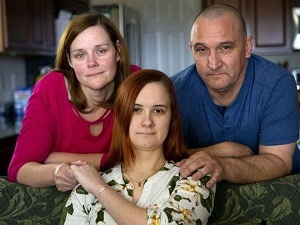 PHOENIX – Caitlin Secrist, a 21-year-old college student blocked from lifesaving surgery because she can't get copies of her medical records, will receive the file after Arizona Gov. Doug Ducey and a judge intervened Wednesday. Secrist can't eat, can't work, delayed her college graduation and is in constant pain because of acute pancreatitis. She wears a feeding tube around the clock and depends on handfuls of medications. More than a dozen hospitalizations later, the next pancreatitic attack could kill her. But a top doctor at Johns Hopkins Hospital refuses to perform the operation without a complete understanding of Secrist's health history, including what her organs looked like when she was originally diagnosed, she said. Without the first scans taken in 2017, Secrist can't move forward.